Indians working abroad sent home $68 billion in 2015, making India the top remittance receiving country, surpassing China. 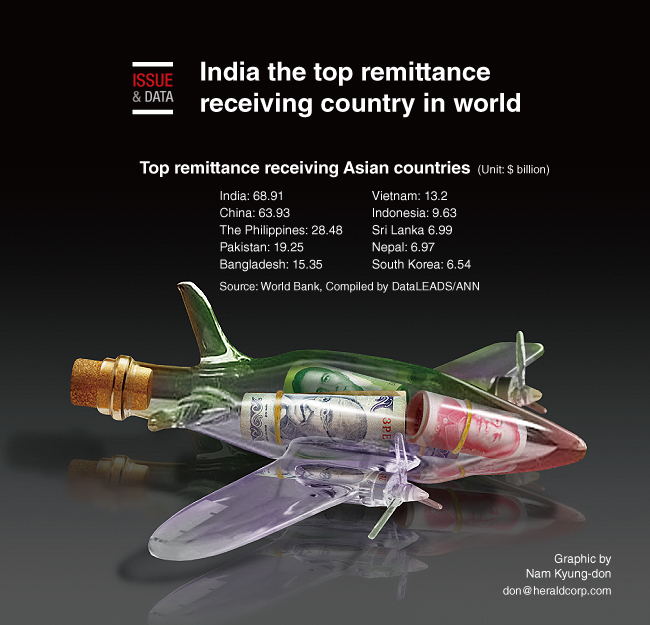 Other top receiving countries for remittances from Asia include the Philippines, Pakistan, Bangladesh and Vietnam. Indians working abroad continue to send more money home than their counterparts from other countries, according to World Bank figures on migration and remittances. India topped the list with $68.91 billion in remittance inflows, followed closely by China at $63.93 billion. The Philippines is the third-highest remittance receiving country in the world. Remittances are a mainstay of the Philippine economy, as they are seen as a driver of domestic demand in the country.